Being close to the front of organic search results is really important to anyone who owns a website. It is seen as the holy grail of a good website but it isn’t always easy to reach the top as many a blog owner knows. 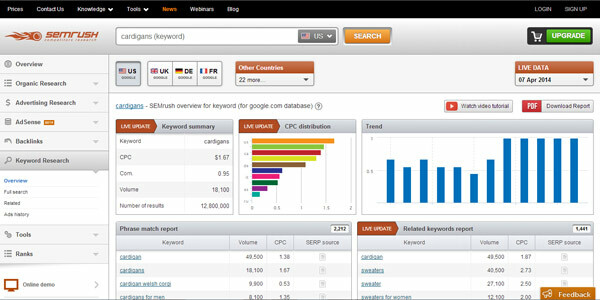 Semrush tool helps you discover who is ranking highest for particular keywordsand in which country, you can discover which keywords are particularly expensive or alternatively cheap, if they are increasing in price to help you with your Adwords campaigns. Not only can you see how a particular keyword is performing and who is achieving the best result in search engines for it but you can also discover other keywords that relate to the keyword you are trying to target. The benefit of discovering keywords is that when you start writing new blog posts or web pages around your product or service you can discover which keywords are less competitive and what seems to be trending to boost the likely traffic to your website. 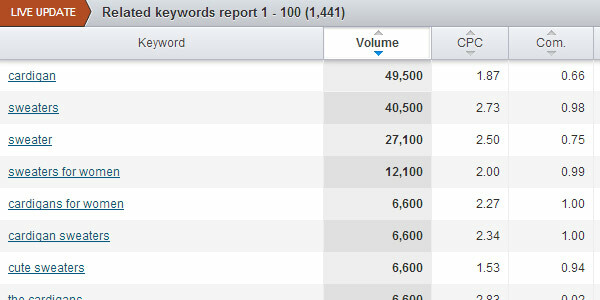 So for example, in the below image you can see how many times ‘cardigan’ keyword has been searched for (49,500), how much it costs per click (CPC) and what I think is very beneficial, how competitive the keyword is to allow your content to be found and clicked on, the lower the number the less competitive the keyword. There are many more options but I will let you explore the keyword discovery website for yourself. Just know that on the free version you can only search for a small amount of keywords and you don’t get as much results as you would on the paid version. Don’t let that put you off, go and check it out NOW! Is the keyword still trending? 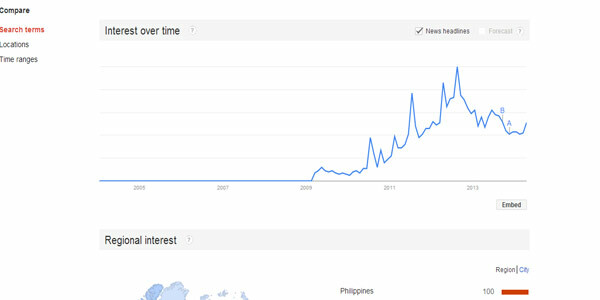 Lastly, to make sure you are targeting a keyword that may be increasing in popularity check out Google Trends. This tool helps you see if your particular topic is going to be worth the effort. Will it bring in a massive influx of new traffic and hopefully fans of your content or not? If the keyword is not going to attract people to your website how else can you bring your services into your potential customers consciousness? Can you target another keyword, do you need to rethink your product and or service? Or do you need to reconsider how to reach out to the potential market you are targeting? I hope you find these tools useful and if you have any other suggestions about creating great content to help improve organic search results and traffic then please feel free to comment in the box below.